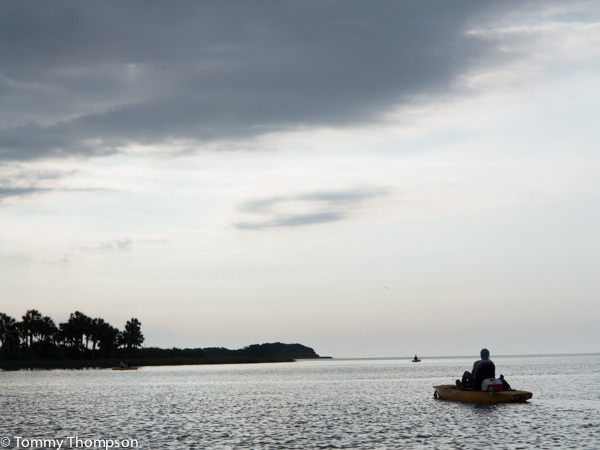 Last weekend I left my flats skiff behind in Steinhatchee and joined a couple of other outdoor writers in Wakulla County for a kayak-fishing adventure. 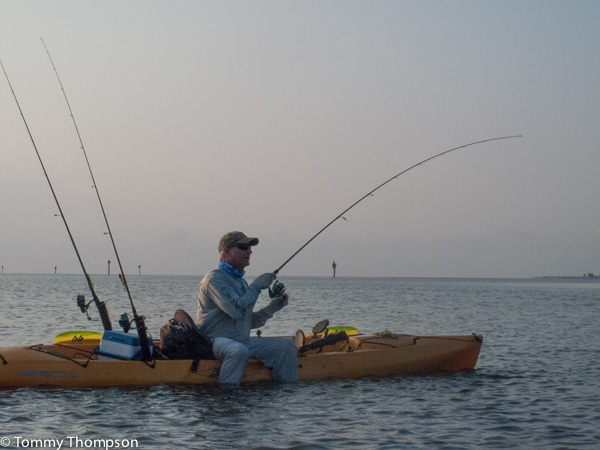 Of course, over the years, I’ve made numerous trips out of St. Marks, Panacea and Spring Creek, but never had much chance to fish the shallow, close-in flats and inshore bays and bars. 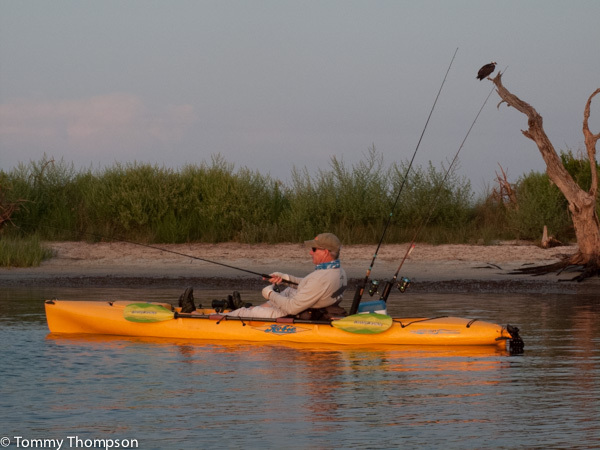 Kayaks were the conveyance of choice, and thanks to Robert Baker at Reel-Fin-Addict Kayak Fishing in Wakulla, we had some comfortable Hobie Master Angler boats to pedal. Equipped with Mirage Drives and seats that seem to come directly from the Cadillac Motor Division of GM, these boats are silent and stable, allowing the angler to get close to fish and avoid spooking them in even the shallowest of water. Robert also knew where we’d find some fish! First, let me explain the territory. Wakulla County offers a diverse and very fishy shoreline. There are good ramps for powerboats at Aucilla, St. Marks NWR, at the confluence of the St. Marks and Wakulla rivers, at Shell Point, at Panacea and at Mashes Sand. There are even more ramps that work well for paddle craft, in particular the one we used on day one, at the southern end of Bottoms Road. 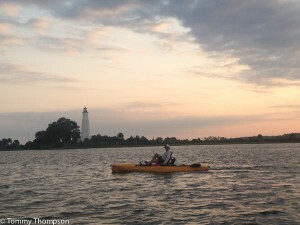 This shallow ramp is maintained by the county and has a $5 fee, but it allows you to launch well towards the mouth of Dickerson Bay, just inside Mashes Sand Point. We simply paddled across the channel and were soon on a shallow grass flat literally infested with baitfish and predators. Robert and I threw Heddon topwaters, Jimmy threw a Clouser Minnow fly, and Jerry tossed a subsurface Live Target Scaled Sardine. 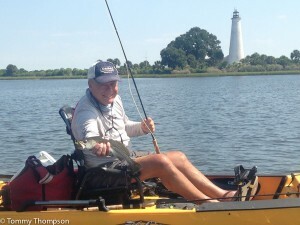 Everything worked on some nice reds, seatrout and we even caught a Spanish mackerel or two. 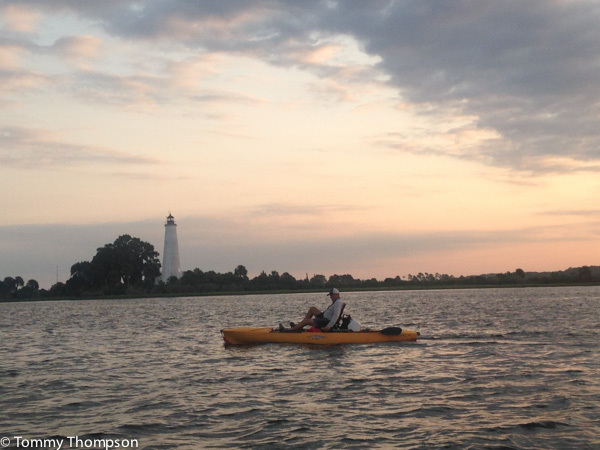 On day two, we moved east and launched at the St. Marks Lighthouse. There’s a big fancy ramp just before the end of the road, but we continued to the end and used a couple of primitive ramps. From there, it was a short paddle (pedal!) to bars lining the main St. Marks Channel and to the flats to the east. Again, bait fish in the form of whitebait, pinfish and mullet were abundant, as were seatrout, mackerel, and some fun ladyfish. If you’ve not had a chance to fish this area, now’s the time. The scallop “crop” at St. Marks hasn’t been great this year, so there are plenty of places to stay, to eat, to launch–and the waters are not too crowded. To reach Wakulla County, head west on US98 from Perry and you’ll eventually come to St. Marks, Medart (a suburb of Crawfordville) and Panacea. It’s also the coastal county immediately south of Tallahassee. As for lodging, I recommend the Best Western in Medart. For food, don’t miss Posey’s Seafood, Hamaknocker’s BBQ, Outzs’ Too, or Tropical Traders’ Seafood. All are worth a visit; all are casual; and all will keep you from starving to death—a great thing after paddling or pedaling all day. And finally, T ‘N T Hideaway (Located at US98 and the Wakulla River) rents a variety of fishing kayaks and also offers guide services. You don’t even need to bring a boat!